The International Society of Scratchboard Artists normally holds its annual exhibition in prestigious galleries in North America, but in Feb 2017 it is in South Australia. 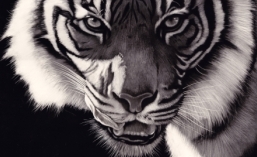 Come to the opening night, February 10th, and see some of the finest scratchboard art in the world. We have exhibiting artists from the US, Canada, Germany, New Zealand, China and South Africa, not to mention all over Australia in the lovely Stump Hill Gallery in the beautiful winery region of McLaren Vale in South Australia. Many artists are flying in to attend the show and it is a great opportunity to meet some of the world’s finest artists, see and purchase amazing art. If you can’t come to the opening night, the exhibition lasts for five weeks until March 16th 2017. I will have a couple of pieces in the exhibition and these are below, so if you are in the area, I’d love to see you there.